Our kitchen is pretty 80's. But, it's ours and we figure we're going to be in this house for a while, and are willing to work on it. 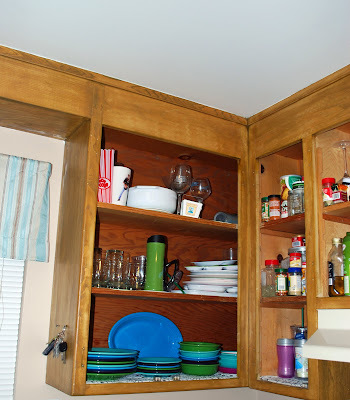 Tony decided that it was time to do something about our cabinets. The wood was light, light brown and the hardware was AWFUL! I only took one "before" picture, because the time I got around to it Tony had already taken off all of the cabinets, and seeing the shelves made me realize I can never have those beautiful glass cabinet doors I'd like. 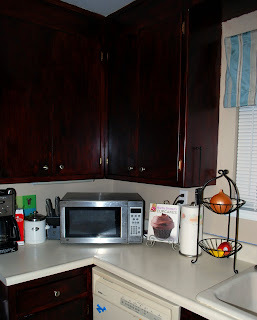 New, dark cherry stain and brushed nickel hardware made a HUGE difference, and took our kitchen, one small step away from the 80's. I'm excited to see what he'll do next! Did he have to sand them first? Was it really tough? 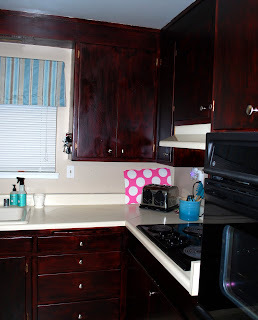 We are dying to give our cabinets a makeover. Thanks, girls! Gina - he did have to sand them all first, which took him a day by itself! Plus, the stain STINKS! We've had the kitchen window open for three days and I smell it. But - it's worth it! that looks AMAZING! 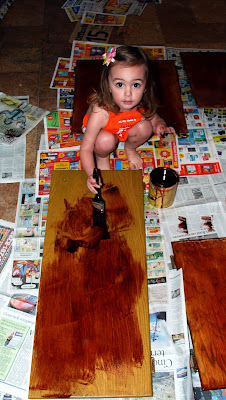 we've really been wanting to do that with our kitchen, but we lack the time. did tony use a professional grade sander or did he do it all by hand? gosh it looks awesome, this gives me motivation. our kitchen needs HELP. COMPLETE 80's. Tara - not sure if it was "professional" but it was battery-powered. The only bummer is the battery would lose it's charge after a few cabinets so Tony ended up sanding a lot of it by hand, anyway. Oh my goodness! It looks fabulous!!! Looks great I love the dark wood..